In my in-laws place they do pooja on Naga panchami- Garuda panchami and make this paal kozhukaati and do neivedhyam to God. 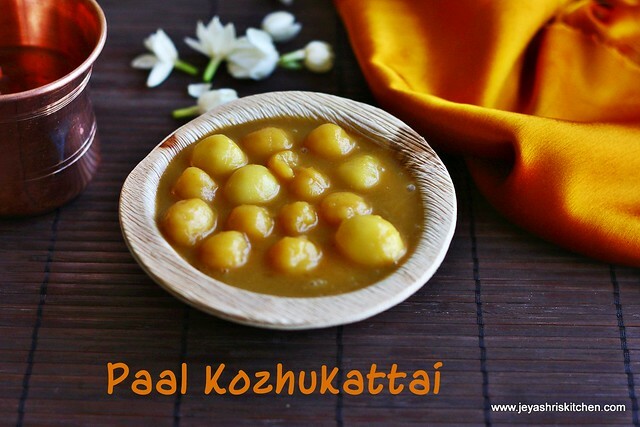 Today being Naga panchami i made this and did my pooja and did neivedhyam and sharing the recipe of paal kozhukattai with you. I used jaggery and coconut milk in this recipe. The original recipe i adopted from here. In a kadai add milk and 1 cup of water and 1/4 cup of milk ,the rice flour and a pinch of salt. since i used the idiyappam flour i didn’t add salt. Add a tsp of ghee to this. Heat in a medium flame by stirring continuously till the water completely evaporates . Knead the dough by adding sesame oil to this. Cover this with a wet cloth till you use this. Add jaggery in a vessel along with 2 tblsp of water and dissolve the jaggery. Make the dough into small sized balls. In a pan add 1 cup of water and heat till luke war. I used the store bought coconut milk and i diluted this . Take 2 tblsp of coconut milk and add 1/2 cup of water to this. Add the jaggery water to this. Mix it well with the luke warm water. Keep the flame medium. Add the rice balls to this and boil for 3-5 mins . Add elachi powder to this. Switch off the flame add 1/2 cup of thick coconut milk to this. Mix Well. I prefer this serving chilled. You can replace jaggery with sugar also. 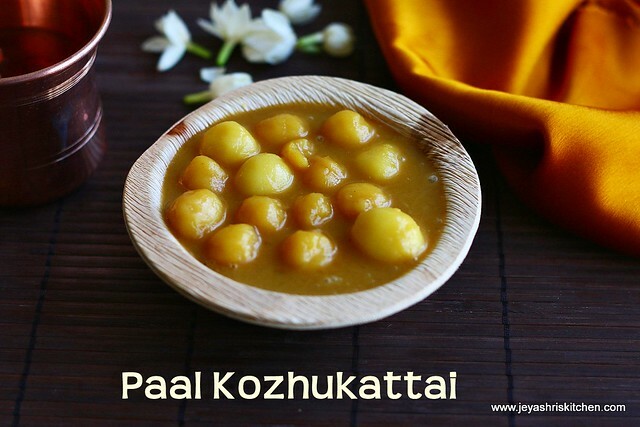 Do not cook the paal kozhukattais for too long time. My favorite traditional sweet :)Looks very delicious and neat presentaion too..
i tried dis sweet from the same blog...it come out very well...but i didnt take photo...urs looks yummy! !nice presentation! Congrats on moving to ur own domain...So another reason for this paal kozhukatai :) This is my fav amma makes it almost the same...looks delicious!! Excellent recipe dear....loving the clicks!!! Nag panchami special .. looks so yummy..
delicious treat....looks yummy and u tempted me to make it!!! What a lovely sweet dish!!! Great clicks! Yumm yumm. feel like having it right away. Yummy and delicious. 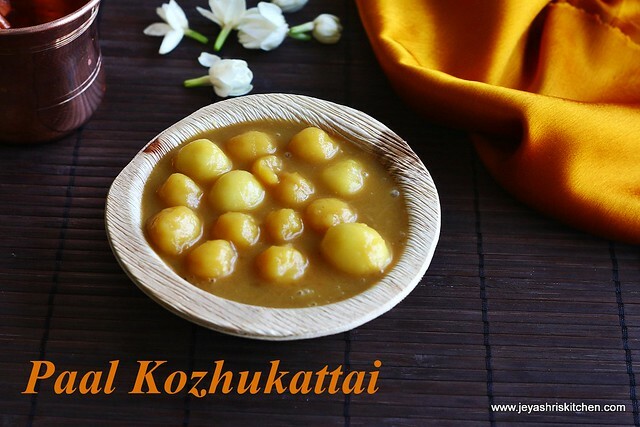 This is surely a big hit with a twist of jaggery instead of sugar. Delicious version jeyashri,luks perfect...love the background and matching the sari,too gud. My brother's favorite so my mom always makes it for him... looks great Jeyashri. That looks so so delicious..love to have some now :)..yumm!! Divine and delicious perfect for the festival. One of my most favorite sweets. But havent tried much at home. Used to have it at a friend's house. We make those balls into sundal and have. This is one of my favorite recipes of my granny. Want to have one spoonful. Love this sweet with jaggery, looks so divine! Hi,can i make and rice balls without adding milk. instead use just water .? Hi, can i use only water (avoid the milk totally) to make the rice balls? Very good recipe. But it would be really helpful if you are a bit more careful while typing. You have asked to dissolve quarter cup jaggery in 2 tbsp of water. And also a few repetitions which makes it all the more confusing. For beginners, exact measurements of the ingredients will go a long way in honing their culinary skills. Please take extra care while typing. Otherwise you are doing an awesome job..keep up the good work!